Cassava cultivation can be an alternative in drought-like situation. Cassava or tapioca is a rich source of carbohydrate and widely used as an alternate food source. Cassava root is the commercially used part while the stem is used for propagation. The most interesting fact about cassava is that it can even grow in nutrient deficient soils. Cassava or tapioca is a wooden shrub cultivated for its starchy root worldwide. It is a rich source of carbohydrates and is one of the most widely used foods next only to rice and maize. It is cultivated in the tropics and is a staple food for people of the developing world. When the roots are dried and made into a powdery extract it is referred to as tapioca. Nigeria is the largest cassava producer while Thailand is the largest exporter of dried cassava. Owing to the high amount of carbohydrates it is a popular basic diet for millions across the globe. It is also used as a food thickening agent in food manufacturing industry. Cassava is botanically named Manihot esculenta and belongs to the Euphorbiaceae family. It is a perennial woody shrub. In the sense the stem is strong and wooden-like. The roots are edible part of the plant and it is rich in carbohydrates. The shrub can grow up to 9 feet high and the tubers are on an average, 30 cm long. However some can grow up to a meter in length. The cassava roots are processed and is known as tapioca. In India tapioca pearls or small balls are popular diet for patients. Being a tropical crop, tapioca requires a warm, tropical weather with well- distributed rainfall. For a good crop, it needs eight months of warm weather. If the weather is cool and dry then it would require a period of at least 18 months to fully mature and produce crop. It is well-known for drought tolerance. Under drought-like conditions, cassava conserves moisture by shedding the leaves. It produces new leaves when it starts raining. Cassava can be planted at any time of the year if there are adequate irrigation facilities. 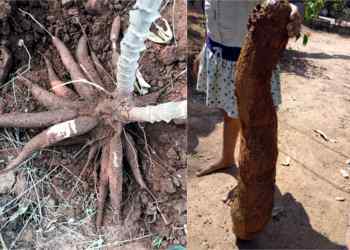 If the water supply is completely dependent on the rains then cassava is planted just after the pre-monsoon showers. It is planted during the months of June-July in most states of India. However in southern and some eastern states of the country like Kerala, Tamil Nadu and West Bengal, planting is done during April-May as the pre-monsoon showers start a little early here. A well-drained soil is preferred for cassava cultivation. It cannot tolerate flood like conditions and the roots run deep. Hence, red laterite soil is the best suited for the cultivation purposes. Sandy loam soil is also good since it allows water to drain while holding back the moisture content. 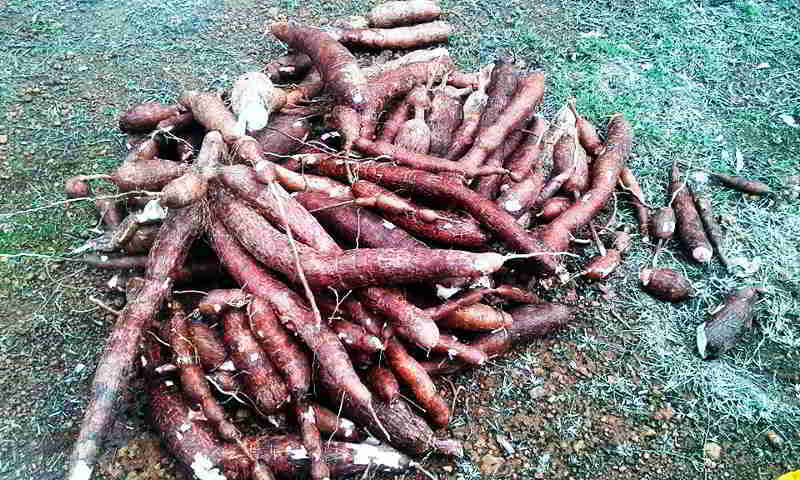 An advantage of cassava cultivation is that it can grow in soils with low fertility level. Sometimes cassava is cultivated in poor, nutrient deficient soil to increase its fertility. Tapioca tolerates soil pH in the range of 4.5 to 8.0. Tapioca can be planted as both rain-fed as well as irrigated crop. However, for the first three weeks after plantation the soil must have adequate moisture supply to lodge itself and produce healthy tubers in the soil. Generally the first irrigation is done immediately after planting followed by the second one on the 3rd day. After this it is irrigated once a week for the next three months. After three months it is irrigated once in every 20 days up to the eighth month. However, throughout its growth period the soil moisture content must be closely monitored. The field must be irrigated as soon as the moisture content dips below 25%. Studies have shown to increase the yield if the irrigation is done on the basis of monitoring the soil moisture content. For watering the plants, drip irrigation is the most preferred type of irrigations system. Flooding the field is not preferred since tapioca cannot tolerate huge amount of water. Drip also ensures that water is dispensed only at the base of the plant near its roots. In the initial first three months of plantation, leguminous crops like pulses are cultivated. This is especially done if the soil is poor in nutrient levels. Some farmers also grow maize or groundnut along with cassava. However these crops must be harvested within the first 90 days of cultivation. This high yielding variety matures in 10 months. They are resistant to drought, leaf spot, scale insect spider mite and mosaic diseases. Average yield is 10-15 tonnes per acre. Most popular industrial variety in Tamil Nadu. High yielding variety maturing within 10 months. They are resistant to scale insects and spider mites. Average yield is 15 tonnes per acre. The plants are erect and non-branching. They are the first triploid variety to be developed. Tolerant to drought and resistant to spider mite, scale insect and leaf spot. Yield about 10-15 tonnes per acre. Hybrid variety of tapioca is excellent for cooking. They can be cultivated in low land as well as upland areas. They are tolerant towards spider mite and leaf spot. They are the first cassava mosaic disease resistant variety to be developed. Suitable for cultivation in the irrigated plains of Tamil Nadu as well as rain-fed areas of Kerala. They mature within 5 months and are ready for harvesting. The tubers have a high starch content. The flesh is yellow in color. They can be harvested within 7 months of cultivation. They are tolerant towards mosaic disease. It is a triploid variety and the plants are erect, non-branching type. They are suitable for cultivation in Kerala and Tamil Nadu. This variety is used for both extracting starch as well as in cooking. Tuber size is big and flesh is white in color. It is a high yielding variety with the tubers containing 27% starch. Tubers also contain 466 IU per 100 grams of carotene. Plants are non-branching and grow upto 2.5 meter tall. It matures within 10 months and the average yield is 15 tonnes per acre. They resistant to scale insects and spider mites. Propagation of tapioca is done vegetatively through the use of stem cuttings. About 20 cm of stem is cut from healthy, disease-free plants. The soft, tender top portion and the thick, woody bottom portion is discarded. Only the firm middle portion is used for cultivation. The cuttings are immersed for five minutes in Dithane M-45 and Dimethoate (2 mL per liter) solution. This is primarily done to disinfect it from any possible infection or diseases. After immersing in the disinfectant, they are directly planted in the nursery beds and watered every day for a week to initiate the rooting. About 5000 stem cuttings must be maintained for one acre of plantation. They are transplanted into the main field after a period of one week. Preparing the land for tapioca cultivation depends on the type of soil. For example, tapioca is cultivated as mounds if the soil is heavy and textured. Under irrigated conditions, furrow method of cultivation is followed. The land is ploughed 4-5 times to loosen the soil. Farm Yard Manure, superphosphate, lindane dust etc. are applied to the soil while ploughing. Beds with good drainage facilities are then prepared for tapioca cultivation. While planting the seedlings from nursery to the main field, the soil must be loose and have enough moisture. It is recommended to loosen the soil around the area of cultivation. The stem cuttings must be planted up to 5cm in depth. Planting it deeper may result in swelling and hence poor yield. Tapioca is susceptible to weeds during the initial stages of growth. Hence regular weeding must be carried out. Some farmers also practice mulching using leaves. This is the best way of achieving weed control. Mulching not only prevent unwanted plants from growing but also preserves the soil moisture. 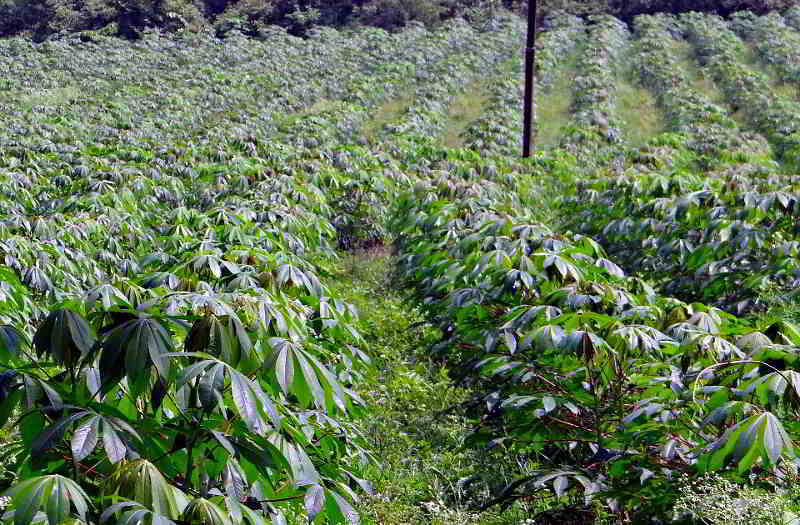 Organic farming is the most preferred farming method in cassava cultivation. Farm yard manure is commonly used for cultivation at the time of ploughing. About 10 tonnes of farm yard manure per acre is applied. Phosphate, nitrogen and potassium fertilizer is applied after 90 days of planting. Once the first rains set in 2 Kg of Azotobacter is applied on the field. Regular field inspection is the best way to control the spread of diseases and insects. Another method is to practice intercropping pattern. Crops like maize, groundnut, black grams are cultivated which help in controlling the diseases. Tapioca harvesting is done manually by uprooting the plant and breaking the tuberous roots. They are generally ready for harvesting within 10 months. Once they are ready the soil around the tapioca plant turns loose and starts powdering. This is because the roots do not run deep into the soil. The lower part of the stem is lifted and the roots are pulled off the ground. They are then detached from the plant base manually. This detachment process must be done carefully so as to not break the tuber. Usually the upper part of the plant- the leaves and stems are cut before uprooting the plant. The stems of the uprooted plant are cut 1/3rd away from the leaf. The stem cuttings are then stored for the next plantation cycle.